In 2016 I read only 14 books. I don’t really know how that compares to the “average person’s” yearly reading, but compare that to the 38 I read in the previous year or the 12 I’ve already read in 2017 plus the two I’m currently reading, and you can see that 14 is a low number for me. This reading slump could easily be attributed to being busy at work and at home; last summer it felt like there was a wedding or some other event to attend every weekend. When there was some down time, all we, my partner and myself, wanted to do was settle in on the couch and binge watch something on one of the four streaming services to which we subscribe. So while I could easily blame my disinterest in reading on the overwhelming number of options available to me in this the digital age of wonders, and “peak TV,” I posit that it was something more than that. From January 1, 2016, all the way up to the election on November 8, we as a nation were inundated with politics and, whether we realized it at the time or not, it took a toll. I can’t be the only one who by the time we got to fall 2016 was longing for the election to be over so that our lives could go back to normal. Little did I know that instead of returning to normalcy post-election we would be thrown into even greater turmoil. In 2016 every time I would pick up a book I’d been wanting to read, that had been recommended to me, that sounded right up my alley, I’d ultimately end up getting frustrated with it. In the past I would read nonfiction from time to time, but a vast majority of the books I’d usually read for pleasure and to relax tended to be literary fiction with some fantasy thrown in. I like slipping into other worlds, getting to know new people and places, and getting lost in prose, but in 2016 I kept getting stuck. Some books I’d get annoyed with due to their misogynistic undertones, I’m looking at you science fiction and fantasy, but many I’d start and just wouldn’t feel compelled to keep reading for no specific reason; I was plagued with apathy. I’d get half way though and either never finish or have to force myself to finish dragging myself lethargically over the finish line of the final words on the final page. I’m the kind of person who will stay up into the night as my eyes grow heavy and the hours tick by just to keep reading. “It can’t just be that I’m picking bad books,” I kept thinking to myself. Then the election came and everything hit a breaking point. For the next two months I really struggled, I caved in on myself, I felt lost and helpless, I felt angry and alone. I knew I needed to allow myself to grieve and to rage, but I also knew I needed to come up with a plan to move forward to fight, and this is where I found my way back to reading. At the end of March I attended the Association of College & Research Libraries (ACRL) biennial conference where Roxane Gay was the opening keynote. As a fan of her work I was thrilled to hear her speak and one of the things she said in response to a question at the end of her talk really resonated with me. During her talk she said something to the extent of “I don’t want your allyship, I want your fight,” saying that being an ally is useless if you aren’t willing and able to look at people who are different from you and not just say you support them, but actually make their fight your fight too. So during the Q&A someone asked her what we could do as individuals to better empathize with people who are different from us in order to better understand and join their fight and Gay responded “read.” She explained that whenever she is trying to better understand a group of people or a movement she turns to books; she believes reading has great power when it comes to building empathy within the reader. Now Gay knew she was talking to a room full of librarians so, of course, she knew this would be a popular answer, but I also don’t doubt for a second that she really and truly meant it. I say this because I identified deeply with what she was saying about reading. In late December, in my post-election despair I had found my way back to reading and was for the first time in a long time reading as voraciously as I once had. In late December after I had finally pulled myself together enough that I was feeling ready to do something and, as I prepared to head home for Christmas to see my conservative parents, I picked up The Whites of Their Eyes: The Tea Party’s Revolution and the Battle Over American History by Jill Lepore. I wasn’t looking for easy answers, but I was trying to find some steady ground to stand on, to try to understand what had just happened in my country. I flew through the book faster than I’d read anything else that year, next I moved onto We Should All Be Feminists, by Chimamanda Ngozi Adichie, The New Jim Crow: Mass Incarceration in the Age of Colorblindness by Michelle Alexander, and both of Ta-Nehisi Coates’s books. It felt good to be reading again and, more than that, it felt good to be reading about social issues that were important to me, and to be getting perspectives different from my own experience. Then in early February in the midst of my reading frenzy a friend of mine, who I haven’t actually seen in person in years, but who I have kept up with on twitter shared this article “A History of Radical Thinking: How Women Created Book Clubs”, asking if anyone would be interested in starting a “radical women’s reading group” with her. I responded immediately. I tend to shy away from book clubs, I like to read on my own schedule, I like to pick my own books, and generally find that choosing a book to please a group unsatisfying. But this appealed to me; it seemed like a good way to not only keep up the momentum I’d found in reading, but to also have an outlet to talk about it with someone else, someone who was similarly motivated. So right then and there we formed a reading group of two, we each came up with three books for a total of six to read, decided on which to read first and picked a goal date to be done by. We’ve now read two books and are on our third, we’re averaging a book a month which gives us time to read other things on our own, and when we finish a book we set up a time to call each other and talk about it. That’s right, we actually have a phone conversation, the two we’ve had so far have each lasted over an hour, and left me feeling motivated and energized. In addition to reading we’ve both gotten more active in our communities, her in Michigan, me here in Pennsylvania, joining political actions groups, going to protests, writing, calling, working, and all of the work we’re doing informs what we read and everything that we read informs the work that we do. Right now we’re reading Freedom Is a Constant Struggle: Ferguson, Palestine, and the Foundations of a Movement by Angela Y. Davis and in the third chapter she talks about how vital community and staying connected is to survival, survival of a movement, and survival as an individual. Things can seem really bleak these days, but I’ve found my way back to reading and I’ve found community. I have found community in the local friends who went me with me to the Women’s March the day after the inauguration, I’ve found community and activism in my profession, and I’ve found community through reading and discussing ideas with a friend who lives 600 miles away in Michigan and who I haven’t seen in person in over 5 years. Sarah Wingo is the librarian for English literature and theatre. 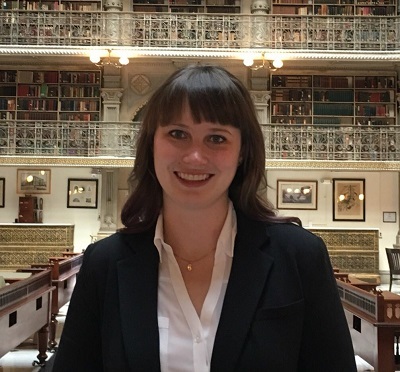 Her contact information: office-room 223, telephone 610-519-5183, email: Sarah.Wingo@villanova.edu She is shown here in a library, of course – the Peabody Music Library, Baltimore, Md. 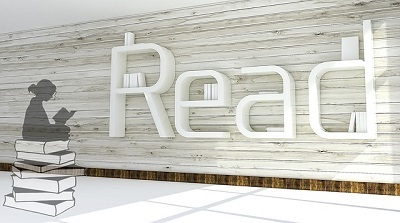 Read image from pixabay.com. Wingo’s photograph courtesy of Sarah Wingo. Great essay, Sarah! Keep the faith.